A Cornell study revealed the molecular mechanism of how antibiotics from human and farm animal waste become trapped in soils, findings with the potential to explain the behavior and consequences of antibiotics in the environment. The new study, published Feb. 15 in the Journal of Colloid and Interface Science, reveals how metals that are abundant in natural soils change the arrangement of clay minerals, causing the mineral layers to come apart and create nanoscale pores that trap antibiotics and hold them in place. The finding is important for predicting the retention of antibiotics in lands based on the chemistry of their soils. It also opens the door for possibly using engineering solutions to remove these potentially harmful residues. "Antibiotics are heavily used in animal agriculture, especially in veterinary medicine," said Ludmilla Aristilde, an assistant professor of biological and environmental engineering in the College of Agriculture and Life Sciences, and the paper's lead author. Co-authors include researchers from the Université Grenoble Alpes and Université de Haute Alsace. Agricultural animals are often raised to grow in close quarters and in high populations, so antibiotics are used to keep them healthy. At the same time, up to 60 percent of each antibiotic dose is not metabolized and is then excreted, and ends up in manure, which is spread as fertilizer on farm fields. Human waste sludge is also applied to lands. As a result, antibiotics including tetracyclines, the focus of this paper, are widely found in fields worldwide, from pig farms in China to chicken farms in the United States. Scientists and health officials have been concerned that these residues of antibiotics may end up in runoff from agricultural lands that flows into streams and rivers and that they may be toxic to soil microbiota or taken up by crops. This paper offers an explanation of the mechanisms that immobilize tetracycline in soil. The study suggests that when trapped in clay mineral layers, antibiotics may possibly be unavailable for runoff or for interacting with microbes and plants, though more research is required to investigate these implications further. It turns out antibiotic compounds carry a negative electrostatic charge, while minerals in the soil also tend to carry negative charges. Since like charges repel each other, a prevailing hypothesis claimed that metals with multiple positive charges in the soil provided an electrostatic bridge that could link antibiotic compounds to the surface of minerals in the soil and hold the antibiotics in place. But this new study presents a different view by showing instead that calcium and magnesium in the soil change the arrangement and structure of smectite clay minerals there, creating layers and nanopores where antibiotics become trapped. 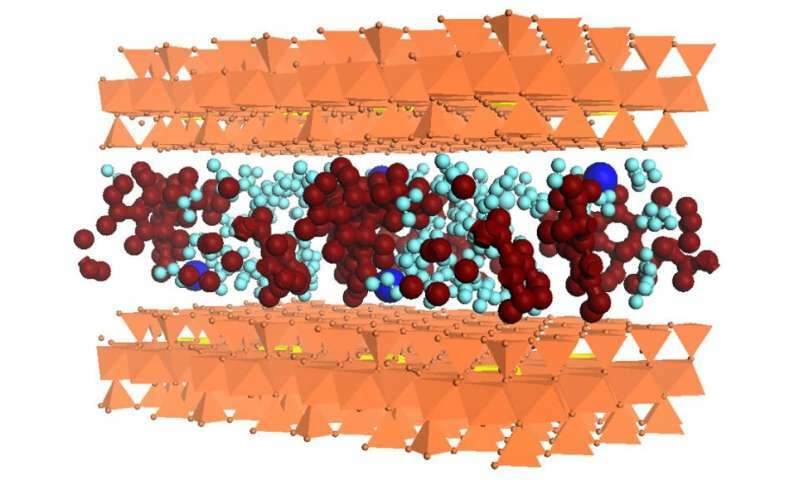 "If these layers don't come apart, then the antibiotics cannot be trapped," said Aristilde. "These metals facilitate the structures to come apart."